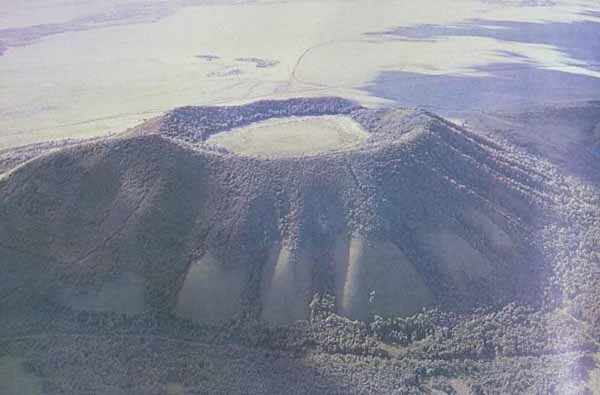 - The Wudalianchi volcano (volcanic field). - The active Changbai volcano(stratovolcano). - The active Tengchong volcano (pyroclastic cones). - The Hainan Dao volcanic field (pyroclastic cones). - Kunlun Volcano (pyroclastic cones). One of the world's largest eruptions during the past 10,000 years took place at Baitoushan volcano (or Changbaishan) on the China/Korea border in the 11th century AD. The most recent eruption in China was from the Kunlun volcano in 1951. China has a few active volcanoes, which are all related to intra-plate mantle plumes and located far from tectonic plate boundaries. The North China block was part of a stable craton until the late Mesozoic, when the lithosphere was thermally thinned, resulting in widespread volcanism and rifting. The volcanism waned in the late Cenozoic, but the lithosphere in the North China block remains abnormally thin (~80 km in places). 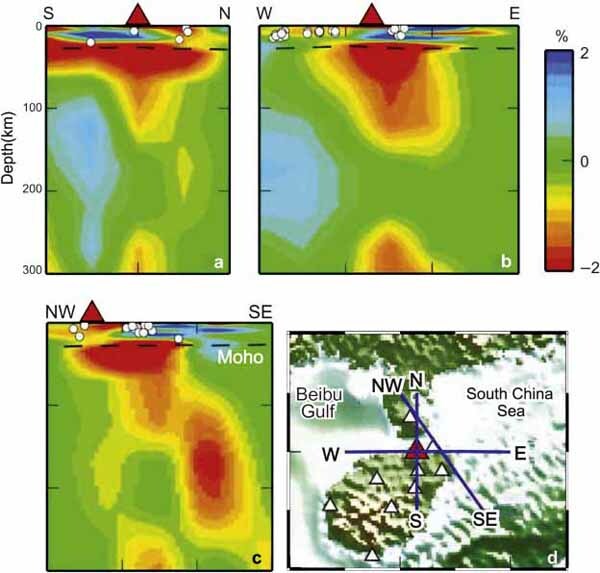 Map showing the surface topography of the Western Pacific and East Asia (Zhao et al., 2009 ). 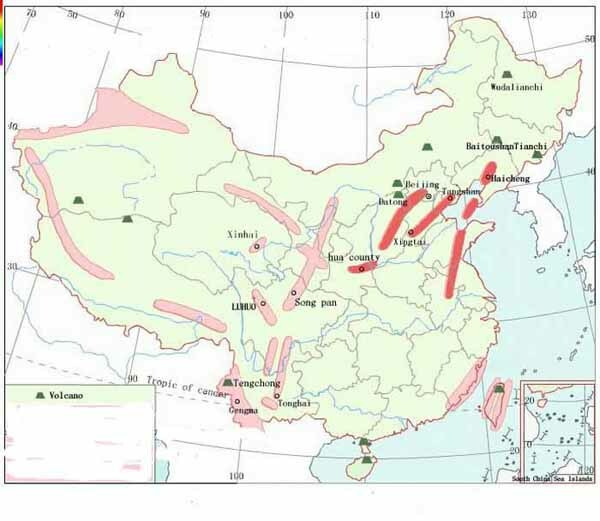 Red triangles show the four active intraplate volcanoes in China: Wudalianchi, Changbai, Tengchong, and Hainan. The dashed lines show the depth contours of the Wadati-Benioff deep seismic zone in the subducting Pacific slab. The red box shows the tomographic inversion area. The intraplate magmatism in China has different origins. Magmatism in the western Pacific arc and back-arc areas is caused by dehydration of the subducting slab and by corner flow in the mantle wedge. 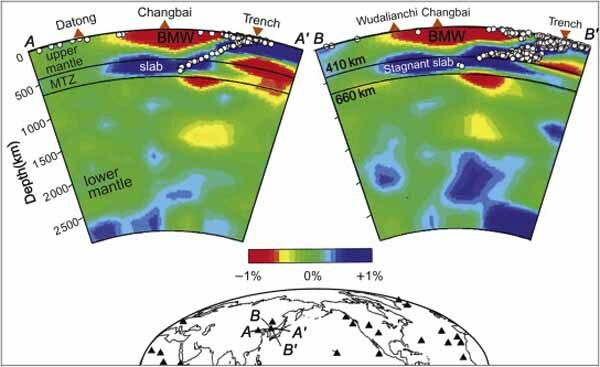 The active volcanoes in Northeast China (such as the Changbai and Wudalianchi) are caused by hot upwelling in the big mantle wedge above the stagnant slab in the mantle transition zone and deep slab dehydration as well. The Tengchong volcano in Southwest China is caused by a similar process in the big mantle wedge above the subducting Burma microplate (or Indian plate). The Hainan volcano in southernmost China is a hotspot fed by a lower-mantle plume which may be associated with the Pacific and Philippine Sea slab deep subduction in the east and the Indian slab deep subduction in the west down to the lower mantle. The stagnant slab finally collapses down to the bottom of the mantle, which can trigger the upwelling of hot mantle materials from the lower mantle to the shallow mantle beneath the subducting slabs and may cause the slab–plume interactions. The Wudalianchi volcano (volcanic field). Wudalianchi volcano is one of the youngest volcanic fields on the mainland of Asia. It covers an area of about 500 km2 located at the junction between Xiaohinggan Mountains and Song-Nen depression in NE China. The last eruption was in 1719-1721 and erupted about 1 km3 of mostly pahoehoe lava. The volcano's name Wudalianchi means "Five Connected Pools" because of 5 scenic lava-dammed lakes. The area has been declared a UNESCO World Heritage Location. The volcanic field contains 14 steep sided cinder cones surrounded by lava flows. The Pleistocene Nangelaquishan cinder cone, capped by a 500-m-wide flat-bottomed crater, is one of 14 cones forming the Wudalianchi volcanic field in Manchuria, NE China. The cinder cones, four of which are Holocene in age, show a preferred alignment along three parallel NE-SW trends. The Wudalianchi volcanic field was named for five scenic lakes dammed by lava flows during a 1719-21 eruption, which formed two new cinder cones and produced a 65 km2 lava field. Vertical cross sections of whole-mantle P-wave tomography along the profiles shown on the insert map (Zhao, 2004). Red and blue colors denote low and high velocities, respectively. The velocity perturbation scale is shown above the map. The white dots show earthquakes that occurred with 100 km from each profile. The two solid lines denote the 410 and 660 km discontinuities. The black triangles show active volcanoes. The reverse triangles show the location of the oceanic trench. 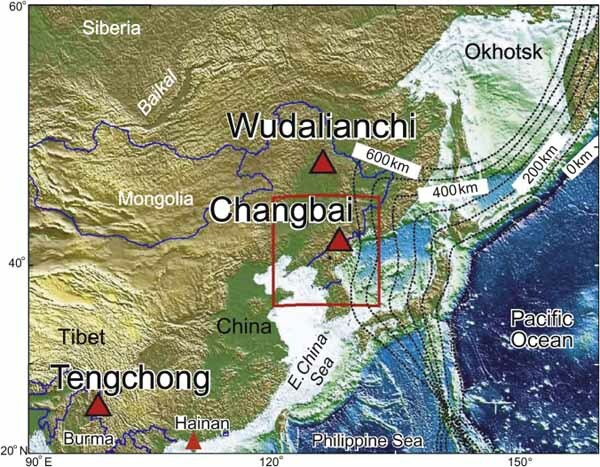 The active Wudalianchi volcano in northeast China is not, like Hawaii, hotspot related. This volcano is caused by hot upwellings in the big mantle wedge above the stagnant Pacific slab in the mantle transition zone under East Asia, and by deep slab dehydration as well. From: http://www.volcano.si.edu/world/volcano.cfm?vnum=1005-03-&volpage=photos&photo=025030 Elevation: 2744 meters. Location: 41°59′N 128°05′E41.98°N 128.08°E. 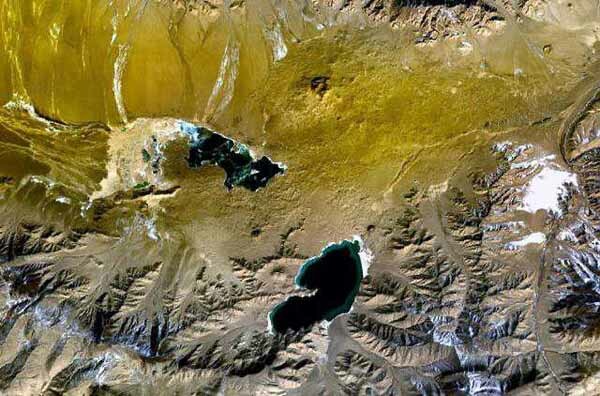 Last eruption: 1903 y .
Changbaishan (or Baitoushan) volcano is a large stratovolcano at the NE China - N Korean border and is and the most active in China. 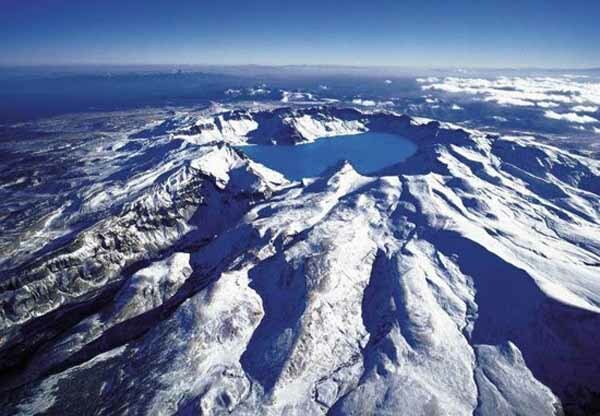 It is also known as Tianchi, or in Korean as Baegdu or Paektusan volcano. One of the largest explosive eruptions in the world during the past 10,000 years occurred around 969 ±20 AD and is known as the Baitoushan eruption. It erupted about 30 cubic km of magma, about half as much as Tambora in 1815 AD or 3 times as much as Krakatau in 1883. The eruption produced rhyolitic and trachytic pumice and ash fall as far as northern Japan, and formed part of the present-day caldera. Small eruptions have been recorded in historic times since the 15th century, the last being a small explosion in April 1903. (a) East–west and (b) north–south vertical cross sections of P-wave velocity tomography along profiles shown in (c) (Zhao et al., 2009). Red and blue colors denote slow and fast velocity anomalies, respectively. The velocity perturbation scale is shown beside (a). The black triangles denote the active Changbai volcano. Dashed lines show the 410-km discontinuity. (c) Map showing locations of the two cross sections in (a) and (b). The red triangle denotes the Changbai volcano. Black crosses and white dots show the shallow (0–30 km) and deep (450–600 km) earthquakes. The active Changbai volcanoe in northeast China is not, like Hawaii, hotspot related. This volcano is caused by hot upwellings in the big mantle wedge above the stagnant Pacific slab in the mantle transition zone under East Asia, and by deep slab dehydration as well. The active Tengchong volcano (pyroclastic cones). Location: 25°14′N 98°30′E 25.23°N 98.50°E. Tengchong volcano is a volcanic field in southern China 40 km from the border with Burma (Myanmar) 430 km WNW of the city of Kunming. The Tengchong volcanic field contains 3 main volcanoes of Holocene age (Dayingshan, Maanshan, Heikongshan), and 65 older volcanoes and cones. The cones at the northern end of the field are probably the youngest, judging from their sparsely vegetated morphology and clearly visible lava flows. A possible historic explosive eruption occurred in 1609 at Dayingshan or Heikongshan, and there are unconfirmed reports of eruptions in the Qing Dynasty (1644-1911). The Tengchong district has several very active geothermal fields, the largest and highest temperature of which is the Rehai geothermal field. The Rehai geothermal field has had over 20 hydrothermal explosions since 1993. 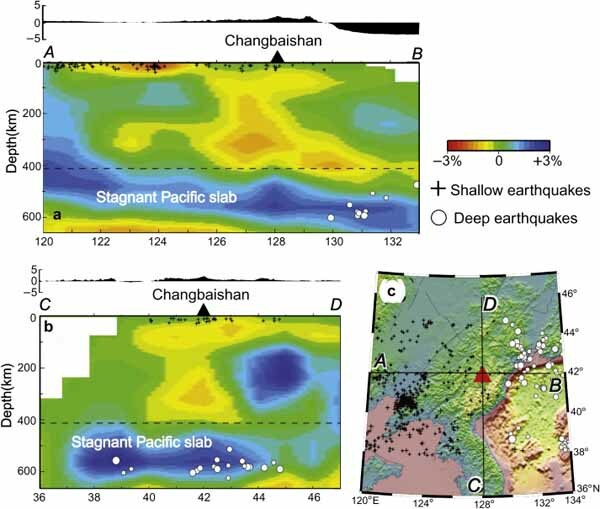 North-south (a), east-west (b) and SW–NE (c) vertical cross-sections of P-wave tomography passing through the active Tengchong volcano (red triangle) in SW China. Red and blue colors denote slow and fast velocity anomalies, respectively. The velocity perturbation scale is shown beside (c). The dashed lines show the Moho, 410 and 660 km discontinuities. (d) A cartoon showing the relationship between the subducting Burma (or Indian) plate and the Tengchong volcano. The reverse white triangle in (b) and the black star in (d) denote the hypocenter location of the 2003 Dayao earthquake (DYE, M 6.2). Volcanism of the Tengchong volcanic field is related to the eastward subduction of the Burma microplate (or Indian plate) under the Eurasian plate near the northeastern side of the collision zone between the Indian and Eurasian plate, which forms the seismically very active Himalayan belt. The Tengchong volcanic field formed in several periods from the early Pliocene to the Holocene. 1 Pliocene to mid-Pleistocene eruptions produced basaltic lavas. 2 Mid- to late-Pleistocene erupted silicic pyroclastic lavas. 3 Holocene: basaltic to andesites. The youngest eruptions were in 2 phases during the early and late Holocene. 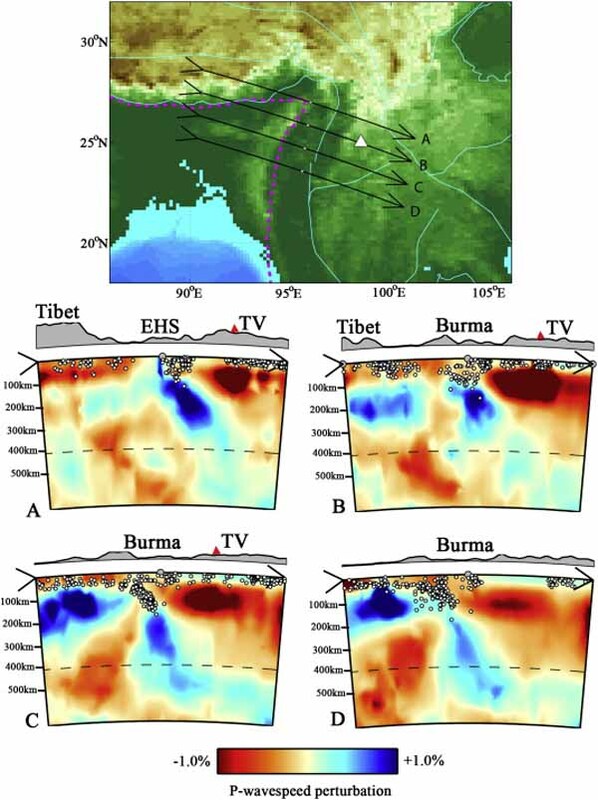 P-wave velocity variations at four cross sections along the Burmese arc from north to south, where EHS-eastern Himalayan syntaxis, TV-Tengchong volcano. The Hainan Dao volcanic field (pyroclastic cones). The Hainan Dao volcanic field is part of the Qionglei volcano group, also known as the Leiqiong volcanic field. The Hainan Dao volcanic field covers about 4100 km 2 of the northern part of Hainan Island (also known as Qiong), across the Qiongzhou strait south of the Leizhou (Liuchow) Peninsula. The Hainan Dao volcano field is of Pleistocene-Holocene age, but historical eruptions were reported in the Lingao and Chengmai areas in the 19th and 20th centuries. Leihuling and Maanshan, two of the best preserved volcanic cones, are oriented along an E-W fracture and are part of a cluster of about 30 cones in the Shishan and Yongzing regions. Small fissure eruptions were recorded in 1883 from Lingao cone and in 1933 from Nansheling ridge. 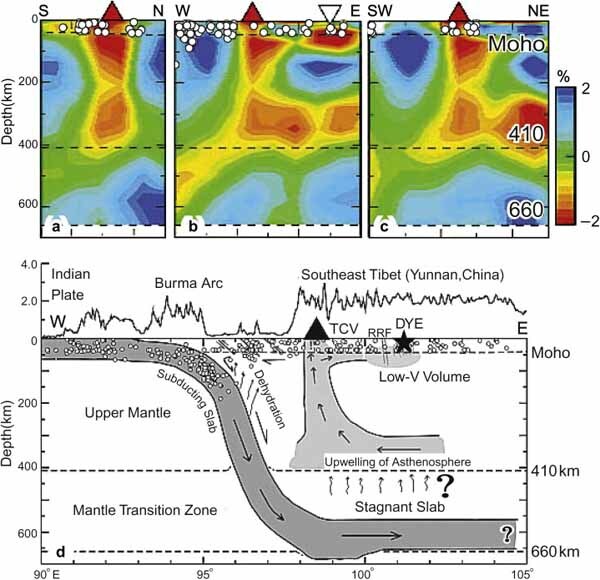 (a) North–south, (b) east–west and (c) NW–SE vertical cross sections of P-wave tomography passing through the Hainan volcano (red triangle) in southernmost China. Red and blue colors denote slow and fast velocity anomalies, respectively. The velocity perturbation scale is shown beside (b). The dashed lines show the Moho discontinuity. (d) Map showing the locations of the cross-sections and 9 seismic stations (white triangles) used in the tomographic inversion.After Lei et al. (2009). Last eruption: May 27, 1951. 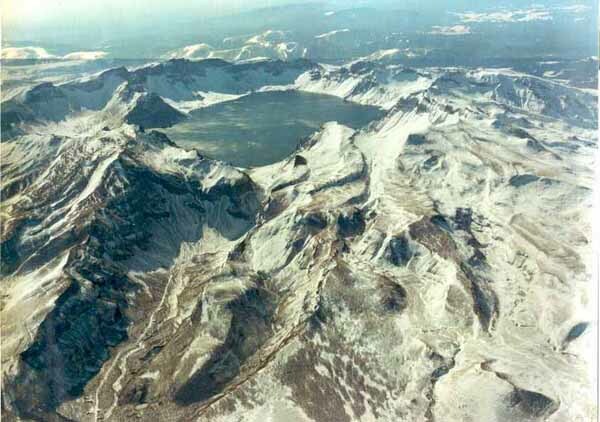 Kunlun Volcanic Group - one of over 70 Kunlun Volcanoes is the highest volcano in Asia and China and second in East Hemisphere (after Mount Kilimanjaro) and one of Volcanic Seven Summits by elevation. 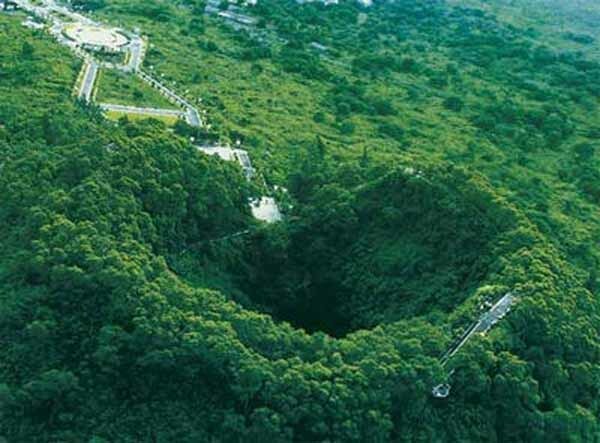 Part of the volcanic field is located in an area claimed by India called "Askai Chin". The Kunlun volcanic group contains 70 pyroclastic cones and basaltic lava flows. Ashi Shan volcano in the western end of the group is the youngest volcano in China (also known as Ka-er-daxi or Vulcan). The eruption of Kunlun in 1951 was the most recent eruption in China. It was a central vent explosive eruption witnessed by road building workers. Eruption of Kunlun Volcano produced emission of ash and bombs.